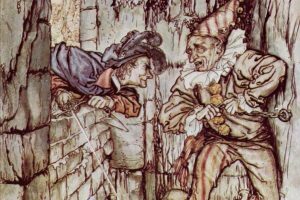 In part 2 of the morbid classic, ‘The Cask of Amontillado’ by Edgar Allan Poe, we saw how Montresor leads Fortunato to a dark wine cellar in his house with the promise for Amontillado, a Spanish sherry. We see how Montresor manipulates Fortunato into thinking that only he is meant to taste the sheery and authenticate it. When Montresor asks him whether he would like to go back, he refuses because he does not want Luchesi to precede in importance over him, especially in the matters of wine. “He is an ignoramus,” interrupted my friend, as he stepped unsteadily forward, while I followed immediately at his heels. In an instant he had reached the extremity of the niche, and finding his progress arrested by the rock, stood stupidly bewildered. A moment more and I had fettered him to the granite. In its surface were two iron staples, distant from each other about two feet, horizontally. From one of these depended a short chain, from the other a padlock. Throwing the links about his waist, it was but the work of a few seconds to secure it. He was too much astounded to resist. Withdrawing the key I stepped back from the recess. In this last part we see the final leg of Montresor’s revenge. As he leads Fortunato further and further into the cellar, he exploits his greed for the cask of amontillado. We find out that the farthest end of the wall is lined with human skeletons piled up and this gives us an idea that either this place might have been a dungeon beforehand or they were all people who had scorned Montresor in one way or another. Montresor then takes advantage of Fortunato’s drunkenness and pushes him to a wall and chains him. Fortunato is a little shocked and is now slowly ising up from his intoxication, the eerie feeling creeping into his bones. Montresor uncovers bricks and mortar and begins covering up the niche in which he has trapped Fortunato. Trough the description given by Montresor while he’s covering Fortunato up, we can sense a little remorse, if not sheer sadness. And guilt. But that does not stop him from exacting revenge upon a man who has borne him a thousand injuries. The amusing or morbid part is, he does not specify, till the end of the story, what those injuries are. This is what makes the nature of the story so fascinating; a man being punished for crimes unknown or not proven by anyone. The Cask of Amontillado exploits the emotion or the raw id of Montresor which refuses to let him see the rational, practical ways in which he could demand answers from Fortunato.